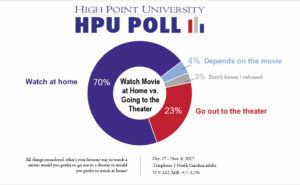 HIGH POINT, N.C., Nov. 15, 2017 – The High Point University Poll finds that a majority of North Carolinians would rather watch movies at home than in a movie theater, and many do not want to go out to theaters any more than they already do. 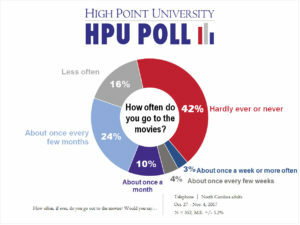 About 2 out of every 5 (42 percent) of North Carolinians say they h ardly ever or never go out to a theater to watch a movie according to the HPU Poll. 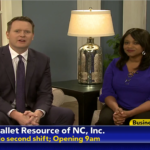 More than two-thirds (70 percent) of those same North Carolina residents say they prefer to watch movies at home, while about a quarter (23 percent) say they prefer to go out to a movie theater. A majority of North Carolinians would not go out to the movie theater more, even if they had the chance. Just a bit more than a third (37 percent) say they would like to go out to the movies more than they currently do, while 60 percent say they would not like to go out to the movie theater any more than they already do. department chair. “Downloadable movies have made home-watching more convenient, whereas before high speed internet, people had to make two trips to Blockbuster to rent a movie and compare that to a trip to the theater. All things considered, what’s your favorite way to watch a movie: would you prefer to go out to a theater or would you prefer to watch at home? Would you like to go out to the movie theater more often than you currently do, or not? 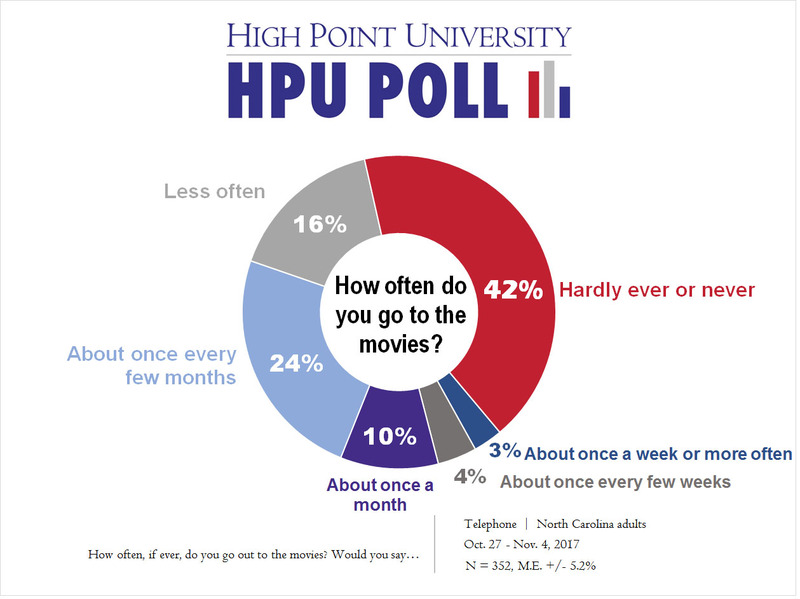 The most recent HPU Poll was fielded by live interviewers at the High Point University Survey Research Center calling on Oct. 27 through Nov. 4, 2017. The responses from a sample of all North Carolina counties came from 352 adults with landline or cellular telephones. The survey has an estimated margin of sampling error of approximately 5.2 percentage points for all adult respondents. The data is weighted toward population estimates for cellular and landline telephone use, age, gender, race, education, and party identification. In addition to sampling error, factors such as question wording and other methodological choices in conducting survey research can introduce additional error into the findings of opinion polls. Details from this survey are available at http://www.highpoint.edu/src/files/2017/11/54memoA.pdf.